Hier werden wir über die Neuheiten der Carrera GO!! !, Carrera Digital 143, Carrera Evolution, Carrera Digital 132 auf der Spielwarenmesse Nürnberg 2012 berichten. 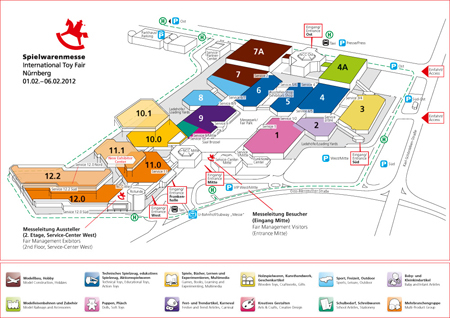 Carrera Messeneuheiten der Spielwarenmesse Nürnberg 2012! Carrera Digital 132 30599 Vodafone McLaren Race Car 2011, "No.3"
Carrera Digital 132 30600 Vodafone McLaren Race Car 2011, "No.4"
Carrera Digital 132 30608 Ferrari 599XX Ferrari Racing Days "No.4"
Carrera Digital 132 30609 Porsche GT3 RSR Manthey Racing, 24h Nürburgring 2011, "No.18"
Carrera Digital 132 30610 BMW 2002 Touringcar '75, "No. 48"
Carrera Digital 132 30613 Disney/Pixar Cars 2 "Max Schnell"
Carrera Digital 132 30614 MINI Countryman WRC "No.37"
Carrera Digital 132 30617 Citroen DS3 WRC "Van Merksteijn, No.20"
Carrera Digital 132 30620 1963 Shelby Cobra 289 Hardtop Coupe, "No.4"
Carrera Digital 132 30622 Bill Thomas Cheetah, Yeakel Racing "No. 8"
Carrera Digital 132 30623 Bill Thomas Cheetah, Daytona 24h 1964, "No. 14"
Carrera Digital 132 30626 Ferrari 150° Italia "Fernando Alonso, No.5"
Carrera Digital 132 30628 Red Bull RB7 "Sebastian Vettel, No.1"
Carrera Digital 132 30629 Red Bull RB7 "Mark Webber, No.2"
Carrera GO!!! 62282 Marvel - The Amazing Spider-man "Manhattan Madness"
Carrera GO!!! 61192 AMG Mercedes SL 63 "Polizei Österreich"
Carrera GO!!! 61236 Red Bull RB7 "Sebastian Vettel, No.1"
Carrera GO!!! 61237 Ferrari F150th Italia "Fernando Alonso, No.5"
Carrera GO!!! 61238 Vodafone-McLaren-Mercedes Race car 2011 "No.3"
Carrera GO!!! 61239 MINI John Cooper Works WRC "No. 37"
Carrera GO!!! 61241 Citroen DS3 WRC "Van Merksteijn Motorsport"
Carrera GO!!! 61242 Ford Fiesta WRC "Munchis Ford Rally Team"
Carrera GO!!! 61244 Ferrari 458 GT2 JMW Motorsports "No.66"
Carrera GO!!! 61245 Ferrari 599XX Ferrari Racing Days "No.88"
Carrera GO!!! 61246 Porsche GT3 Cup "Seyffarth Motorsport"
Carrera GO!!! 61247 Ford Crown Victoria "Police Interceptor"
Carrera GO!!! 61248 Ford Mustang '67 "Custom 2"
Carrera GO!!! 61251 Disney/Pixar Cars "Security Finn McMissile"
Carrera GO!!! 61253 Marvel - The Amazin Spider-Man "Spider Racer"
Carrera GO!!! 61254 Marvel - The Amazin Spider-Man "Lizard Tail Spinner"
Carrera GO!!! 61255 Marvel - The Avengers "Captain America Stormer"
Carrera GO!!! 61256 Marvel - The Avengers "Iron Man Tech Racer"
Carrera DIGITAL 143 41360 Red Bull RB7 "Sebastian Vettel, No.1"
Carrera DIGITAL 143 41361 Ferrari F150th Italia "Fernando Alonso, No.5"
Carrera DIGITAL 143 41362 Vodafone-McLaren-Mercedes Race car 2011 "No.3"
Carrera DIGITAL 143 41363 Ferrari 458 GT2 JMW Motorsports "No.66"
Carrera DIGITAL 143 41364 Ferrari 599XX Ferrari Racing Days "No.88"
Carrera DIGITAL 143 41365 Porsche GT3 Cup "Seyffarth Motorsport"